It was less than 6 months ago that everyone was talking about Joseph Kony. 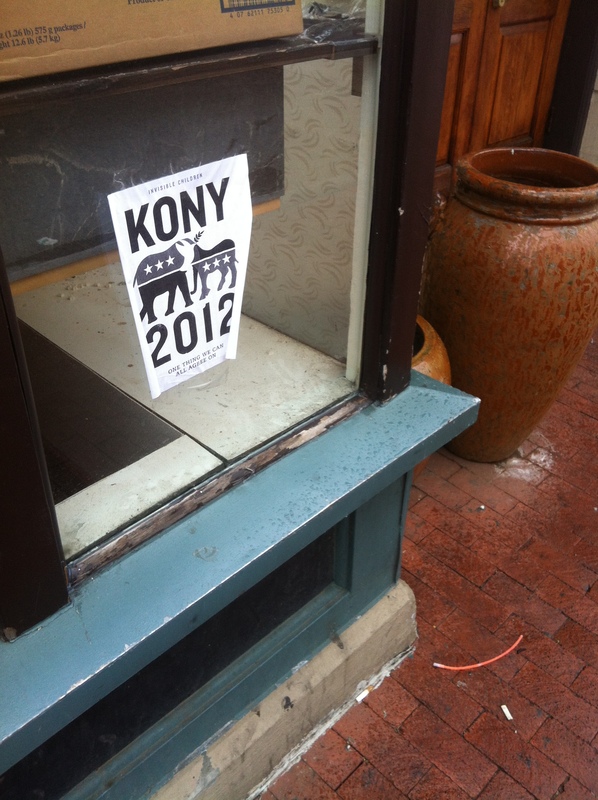 The result of the unprecedented success of Invisible Children’s Kony2012 film that was viewed by millions. Now the dust has settled what can we learn from the success of the film? The International Broadcasting Trusts report, ‘Kony 2012 – Success or Failure’ is one of the first pieces of research that I’ve come across that have spoken to those behind the film and looked at the reasons for its success. I was able to attend a presentation by the report’s author Sophie Chalk earlier in the month. 1. Know your grassroots, know your message – Invisible Children did up to 3,000 presentations to colleges, churches and youth groups in the year leading up to the release of the film. It provided a huge grassroots already motivated and prepared to share the film. Repeated over the last 7 years, it means that the organisation had a very finely tuned message, a result of speaking to over 3 million people face-to-face and knowing exactly what would work with their target audience. How many other organisations have that level of knowledge about their audience built over such intense engagement? 2. Word of mouth matters – Sophie shared figures from SocialFlow, who found that in the first week of the video being launched that the ‘average’ viewer was a 14 – 18 year old girl, but by the end of the first week it was men over 40. Her theory is that this was the result of daughters sharing the film with their parents at the weekend. Sophie also suggests that one of the reasons for its success was that sharing and talking about the film was seen as a ‘cool’ thing to do, as Ben Keesey from Invisible Children says in the report it got ‘hundreds of thousands, if not millions, of young people around the world having conversations about international justice’. 3. Follow up matters – Given the success of the film, the follow-up action to ‘Cover the Night’ on 20th April was a flop. 300,000 people registered to go out into their communities and make Kony famous by putting up posters in their communities, but in the end this hardly happened at all. I was in Washington DC at the time, expecting to see hundreds of posters on the Saturday morning, but in reality only encountered a handful of them. The report shares firsthand some of the challenge that Invisible Children faced. That they found that they couldn’t maintain electronic communications because their servers literally went into ‘meltdown’ as a result of the number of requests that they received. As a result, they weren’t able to keep even some of the momentum behind the film going, sending out only a handful of communications in the weeks after the film was released. A stark demonstration of what happens when you can’t keep following up with those you’ve got interested in your campaign. 5. Save the surprise – Kony 2012 was the only major film that Invisible Children planned to release in 2012, they spent over $1 million in producing it, but saw it as central to their campaigning strategy for the year, thus justifying the investment. They hoped that 500,000 people would watch it by May 1st. 6. Unleash the passion – Sophie mentioned in her presentation that after spending an hour on the phone with Ben Keesey she came away with a new appreciation of the campaigns passion and enthusiasm. Can we say the same in our organisations? What else can we learn from Kony 2012? What other reports or blogs are worth reading about learning from the campaign? Regular readers of this blog will know that over the last week I’ve been on a Daily Mail diet. After realising that I’m living in a bit of ‘media bubble’ getting my news and opinion from very different places from most of my supporters, I’ve been focusing on getting my news from the one most read newspapers amongst the supporters of my organisation. I wrote more about why I thought this was important to do. So for the last week I’ve been buying the Daily Mail alongside my regular paper of choice (The Guardian) and in the process trying to better understand how the paper approaches issues and stories, and think how I might be able to get my campaigning into the Daily Mail, and in front of thousands of my organisations supporters who read it every day. 1 – Daily Mail readers need to be treated with respect – The response of others to my diet has almost been as interesting as reading the paper itself. A number of people have in effect said ‘why are you bothering with the Daily Mail readers they’re never going to be convinced‘ and while most of the editorial positions that the Daily Mail take aren’t the same as mine with 4 million daily readers its lots of people to write off as being closed to my campaign message. We need to respect those who read the paper even if we reject the papers views. 2 – It’s all about people – Most of the main stories this week have focused have had a strong focus on the individuals at the heart of them. Most of the stories go into considerable depth, so any organisation that’s looking to get it issues in the Daily Mail will need to ensure it’s got some really strong and compelling case studies to go alongside any campaign recommendations. 3 – The Mail loves polls, surveys and putting money back in the pocket of its readers – Alongside the focus on people, I was struck at how many stories were based on the results of polls, surveys and research that had some strong and compelling empirical evidence behind it. A large number of the stories cite academic research as the basis for their stories, so perhaps this presents an opportunity for campaigners to ensure their research has compelling and accessible headline numbers to accompany it. 4 – The consumer is always right – Interesting the one campaigning organisation that seems to get regular mentions is Which?, the consumer charity, perhaps it’s because it’s able to speak to the Mail’s concern about getting good value for its readers. I was struck by how few other campaigning organisations got mentioned during the week. 5 – It’s got lots of pages dedicated to comment – This surprised me but the average weekly edition seems to have around 8 pages dedicated to coverage. You get a number of pages of columnists and editorial pieces, along with a number of commentary pieces by the papers staff. That’s lots of writers looking for stories to write about what’s happening, and I’m sure presents an opportunity for campaigns. 6 – I need to do this more often – This whole exercise of thinking about where I get my media from has been really interesting and challenging. I’ve come away convinced that I need to step outside my media bubble more often. As a colleague pointed out to me this week, the algorithms being Google, Facebook and Twitter are all designed to expose me to more people who think share similar views/contacts/opinions to me, so I need to become more active at stepping outside the bubble (this book looks interesting on this topic). It’s a challenge I’d encourage other campaigning colleagues to take up. Do we need to change where we get our news from? I guess I’m like many other professional campaigners when it comes to where I get my news from. My media day looks something like this. I wake up to BBC Radio 5 (or the Today program if my wife gets to the kitchen first), pick up a copy of The Guardian on my way to work, will take a look on the train at what those I’m following, who overwhelmingly hold left of centre positions, on Twitter are saying. I will probably have a look at the BBC News or Guardian websites at lunchtime and then scroll through the long list of ‘progressive’ blogs on my RSS feed. When I get home I look forward to the next copy of the Economist or Foreign Affairs coming through the letterbox and I’ll end the day by watching Newsnight. So this post by Mark Pack about the importance of reading the Daily Mail got me thinking. Am I reading the right news sources or is it time for me to change my media habits? Most organisations will have spent time researching what their ‘average’ campaigner is like based on information from your database. It’s an invaluable exercise to do as it means whenever your writing copy or developing a campaign you can have someone in mind that is the likely recipient of your hard work. But do we think enough about the news sources that our ‘average’ campaigner is receiving their information from? Given that as individuals we’re wired to seek data that is compatible with beliefs that we have, do we spend enough time understanding the news media that many of our campaigners are consuming? The reality is that if I were to draw a Venn diagram between the news media I consume and the ‘average’ campaigner for my organisation you wouldn’t find much in the middle, even less if I’m thinking about key audiences that I might want to bring in to support my campaign. So I’m challenged to change my habits. As campaigners an awareness of the various monthly circulation or viewership figures that come out are really helpful in getting a better sense of what the majority of the public are reading or viewing. Here’s what the latest figures show. Newspapers – As Mark Pack points out the Daily Mail claims to have readership of over 4 million people daily, although its circulation figures show it sells just over 2 million copies each day. The latest ABC circulation figures show that The Sun is the biggest selling tabloid and The Daily Telegraph has the highest circulation of the broadsheets. The Guardian and Independent have relatively small circulations. These figures don’t appear to include the free sheet ‘Metro’ that is ready by many commuters on their journey into our major cities. Magazines – The latest ABC figures show a continued decline in sales of traditional magazines, with TV listings magazines having the highest circulation figures followed by titles such as Now and Closer. What’s interesting is these figures don’t include the massive circulations that free magazines produced by Tesco’s and other supermarkets have. The Tesco magazine goes to over 2 million people, and while circulation doesn’t equal readership it reaches almost as many people than the newspapers with the highest circulations. Radio – The last set of quarterly figures from Rajar show that Chris Evans is the voice that more people in the country wake up to, pulling in over 8.8 million listeners, with Radio 2 being the best performing station, listened to over 14.2 million people each week. Social Media – Their aren’t similar figures available for social media, but the Independent this week has come up with ‘The Twitter 100‘ for the UK based on ratings from Peer Index and for blogging this list is instructive. So next week I’m altering my media habits for 7 days. I’ll be picking up a copy of the Daily Mail alongside my Guardian, heading down to the Supermarket to grab some copies of their free magazines, turning into Radio 2 and following some of the ‘Twitter 100’. It’s a discipline that I hope will help me to better understand where the majority of the campaigners I’m trying to get to support my campaign are getting their news information and the impact that has on the worldview and the context that they place their ‘activism’ in. How do they tell a story? What level of detail do thy use? What angle do they focus on? How would they communicate my campaign? How much space do they give to related issues? What others topics do they seem to be most concerned about? As campaigners, we also need to be aware of the news sources that the decision makers that we’re trying to target are reading and listening. On that a few years ago Duncan Green shared some useful insight drawn from research carried out by Oxfam, my sense is that is still fairly accurate, while a recent Freedom of Information request showed which newspapers and magazines were arriving in the offices of different ministers. What are the key media sources for the campaigners you work with? How do we ensure we don’t get stuck in our own news media bubbles? A new documentary raises some questions about the challenges that newspapers are facing in the UK and the impacts that could have on our use of the media in campaigning. We don’t have a UK equivalent to The New York Times, the paper of record in the US, but even so Page One – Inside the New York Times is a fascinating and thought-provoking documentary for any campaigner who wants to think about what impact the perfect storm of a decline in advertising revenue and the growth of social media will have on newspapers on both sides of the Atlantic and by extension campaigns that use them to raise public awareness of key issues. The film spends a year or so, following the journalists on the Media Desk of The Times as they try to make sense of the changing media landscape and the need to cut costs, while at the same time breaking huge stories like Wikleaks. Some of the themes that documentary picks up on are similar to issues that Nick Davies touches on his excellent book Flat Earth News which looks at the decline of news reporting in the UK, and a book I’d also recommend for anyone wanting to understand the challenges faced by many journalists. What’s the impact of a decline in the resources that are available to newspapers to dedicate to longer and more investigative pieces of journalism? Does this present an opportunity in the short-term where newspapers are more likely to work with campaigning organisation to provide these stories? Will online sites like Huffington Post have the same resonance with policy makers? What takes the place of the columnist or editorials who cited as influencers. Will this increase the importance of key broadcast shows, like Today and Newsnight, when it comes to ‘setting the agenda’? Will we see the same rapid decline in the ‘tabloid’ media? It not, do we have campaigns that were able to pitch to them? What impact does a media model that is driven by ‘popularity’, for example the website group Gawker has a ‘big board’ that displays the 10 most popular stories, have on our ability to get campaign themes that aren’t interesting, but yet of critical importance in front of the public? Is an increasingly open media environment a good thing because it makes it easier to get our messages out, or a bad thing because it makes it harder to get a critical mass of the public aware of our campaigns? I’d suspect that the film will have limited releases in UK cinemas, but I’d highly recommend that you go and watch it or get it out on DVD. It’s not often you see a big NGO come out in public and admit that they got something wrong. So it’s great to see WWF put out a statement today effectively apologising for its lack of public action and clarifying its stance on UK forest sell-off in response to some harsh criticism it’s received in the press this week. It’s a spat that started in the Guardian on Monday when environmentalist Jonathan Porritt accused major charities, including WWF, RSPB and the National Trust of “collectively betrayed” for their failure to support the grassroots campaign that has grown in the recent weeks to halt the sale of English forests, while Polly Toynbee put the boot in on Tuesday accusing green groups of ‘keeping their heads down over selling off forests’. Today, WWF have responded with an excellent statement on their website confessing that they should have done more from the start. Porrit stated “There have been no statements, no mobilisation of its massive membership, no recognition that this is an absolutely critical issue for the future wellbeing of conservation in the UK. Nothing”. There is no doubt that the campaign mounted by 38 degrees and others has gathered a huge amount of momentum in a short time, it’s petition has just gone over the half a million mark. Perhaps most interestingly, it feels like it’s not only the ‘usual suspects’ who are signing on. A non-campaigning friend of mine posted the link to the petition on Facebook tonight encouraging people to sign, and the Observer reported of the opposition of many land owners last weekend. In time it might be right to ask if criticising environmental NGOs in such a public way was the right approach by Porritt? As an unnamed source in the original article says ‘Rule one of clever campaigning is that you don’t criticise members of your team, at least not in public’ and WWF say they’ve been working on this behind the scenes. But for me this spat has once again highlights some of the challenges that the more ‘traditional’ NGOs need to address in their campaigning. Movements like 38 degrees are so well placed, because they can respond within hours not days. They lack the restrictions of charitable status and often no desire for a seat at the table in ongoing consultation. Combine this with a phenomenal e-mail network mean that they can be ‘first to market’. The challenge that many ‘traditional’ NGOs face is that they’re not set up to turn around a response in the time that online campaigns like 38 degrees. No doubt heated discussions have been happening at all the NGOs that Porritt choose to criticise (as you can see implied by the response from WWF), but the very nature of these organisations mean that multiple departments need to be involved and opportunities and risks needs to be carefully calculated, but that whole process takes time, and internal compromises often have to be negotiated. In this digital age waiting even 24 hours to respond or act can be too long. Within a day or so 38 degrees had already collected the first 50,000+ names on its petition, and then you have to ask how much value there is in starting a second competing petition. This for me is the second challenge are traditional NGO prepared to ‘brand’ and ‘profile’ aside and collaborate for the common good when situations like this arise? Would the NGOs named be prepared to promote the 38 degrees petition assuming they agreed with the essence of what it was calling for? On this regard I’ve got a huge amount of respect for WWF for saying in their statement ‘To their great credit, 38 Degrees organised a massive public response (sign here if you haven’t already)’ but no doubt that line will cause some anxiety in the organisation as supporters are encouraged to share their valuable data with others. Collaboration is essential, and to do it well campaigners need to recognise the different roles and approaches needed for effective campaigns. 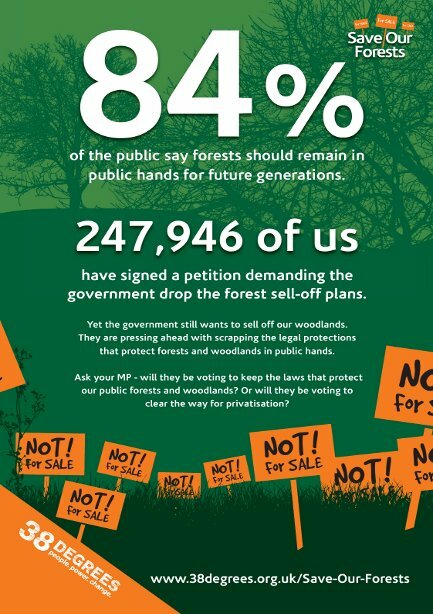 Save our Forests is no different, surely it’d be of huge value to have organisations with both years of experience in nature conservation joining the campaign and impressive contacts within Parliament to be involved. But to do that requires someone to initiate the collaboration, and in situations like this perhaps it’s not clear who that should be. Perhaps it wasn’t Porritt’s criticism and the Guardian articles that lead WWF to clarify their position. The statement from WWF certainly indicates that they’ve also been hearing complaints from supporters saying ‘The scale of passion around this issue has led to a lot of emails as to WWF’s role’. This case seems to be another example of the increasingly complex relationship that organisations have with their supporters. The tools of collaboration and campaigning aren’t just in the hands of a few professionalised campaigners, they’re available to supporters to lobby the organisations they belong to. It also shows that many campaigners are active in more than one campaigning network. Thank you. As a WWF member and supporter of the Save Our Forests campaign, I’m very glad you’ve joined the campaign. The statement above is everything we could have hoped for. Now I’m left wondering if we’ll see the National Trust and RSPB come out with a statement in recent days. The British media seems to have re-awakened an interest in protesting. Last week the Guardian had a go at listing the 10 best protests in history. For hundreds of years the protest march has been a means of voicing passionate concerns. Whether protesting at injustice, challenging inequalities, fighting for better conditions or showing solidarity for fellow workers – demonstrating has been a way of focusing public anger. While some mass demonstrations have ended in victory, others have led to retreat, defeat and sometimes tragedy. Defying the authorities can be a dangerous business. The first part is available to listen to here, while the second part will be broadcast on Wednesday 24th November at 09.05 GMT.